In the frontal offset test, the connection between the A-pillar and the trans-facia beam was damaged in a way that indicated the structure would be unable to withstand higher loads. Similarly, deformation of the footwell showed that the structure had reached the limit of its integrity. Although dummy readings indicated good protection of the knees and femurs of the driver and passenger dummy, structures in the dashboard were thought to present a risk to occupants of different sizes and to those sitting in different positions, and protection of this body area was rated as marginal. Dummy readings, together with the penalty applied for the unstable bodyshell, resulted in protection of the driver chest being rated as weak. In the full-width rigid barrier test, dummy readings of chest compression showed marginal protection of the driver chest. For the rear passenger, dummy readings showed weak protection of the neck and, combined with high shoulder-belt loads, poor protection of the chest. In the side barrier test, the Wrangler scored maximum points, with good protection of all critical body areas. No pole test was conducted on the Wrangler. Tests on the front seats and head restraints indicated good protection against whiplash injuries in the event of a rear-end collision. A geometric assessment of the rear seats also indicated good whiplash protection. 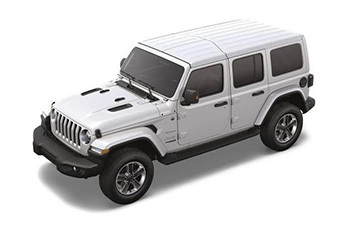 The Wrangler is not equipped with an autonomous emergency braking (AEB) system. In the frontal offset test, protection of all critical body areas was good or adequate except that of the neck of the 10 year child, where dummy readings of tensile forces indicated weak protection. In the side barrier test, the head of the 10 year dummy contacted the car interior and protection was rated as marginal. The protection of all other critical body areas was good. The front passenger airbag can be disabled to allow a rearward-facing child restraint to be used in that seating position. Clear information is provided to the driver regarding the status of the airbag and the system was rewarded. Several problems were seen when installing several child restraints in the vehicle, including those in the Universal category. The protection provided by the bonnet to the head of a struck pedestrian was predominantly poor or adequate. The bumper provided good protection to pedestrians' legs while protection of the pelvis was mixed. The Wrangler has a seatbelt reminder system for the front and rear seats as standard. A driver-set speed assistance system allows the driver to set the appropriate limit, to help prevent excessive speeding.